Share the post "One for Harry Potter Fans"
We have been lucky enough to take in two amazing Harry Potter experiences over the last few weeks, as we have visited both the Warner Bros Studio Tour The Making of Harry Potter in London and also The Wizarding World of Harry Potter in Universal Studios Orlando. 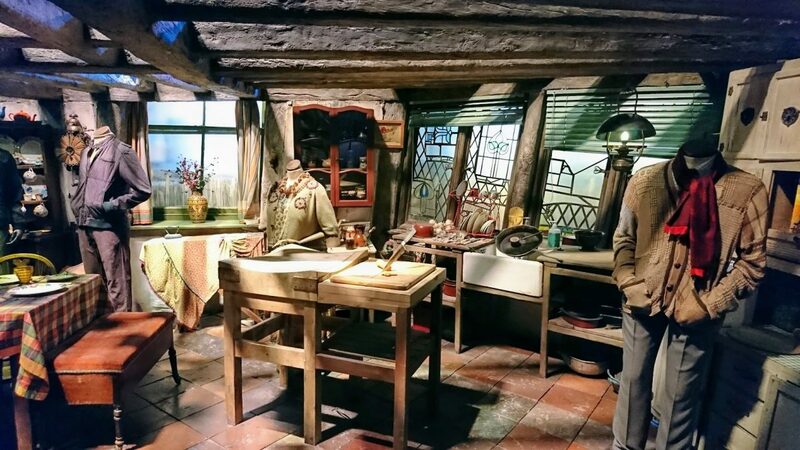 And yes, the kids and I are Harry Potter fans so we have absolutely loved it all, so I thought I’d share a few details and photos today, one for Harry Potter fans. I think I’d start by saying that both are amazing and both are completely different, which is why I’d recommend that if you’re a Harry Potter fan, you really must do both! The Warner Bros Studio Tour The Making of Harry Potter is crammed full of sets, costumes, props and behind the scenes information about the films. Since our last visit, they have added in a small section of The Forbidden Forest which I liked walking around as Buckbeak is in there along with Aragog and a few of his friends. You can also visit Tom Riddle’s gravestone and I’d say Little Man’s favourite part this time was having fun with the green screens for photos and videos (he got to ride on a broomstick – it’s tough to beat that!). Kids are also given passports to stamp throughout the tour as they spot Snitches, which is a great extra touch as they enjoyed looking for these as well as all of the sets and details. One of my favourite characters is Dobby and you do get to see him in a special effects section. You get a great demonstration of how they made him move, and the kids loved doing this part themselves, moving as one with Dobby! As you walk round, there are loads of interactive sections, from making things move inside The Burrow to sitting on Hagrid’s bike, the kids were endlessly mesmerised. You get to freely wander from room to room, taking in all of these amazing sets whilst getting an understanding of how the films were made. At the moment, there’s also a Goblet of Fire special, so the Great Hall is playing host to the Goblet and yes, it does spit out a little piece of parchment with a name on it – magical. You can find out more about the tour and special events here. We were only visiting last week and the kids are already asking when they can go back, so it’s fair to say that they enjoyed it! Now The Wizarding World of Harry Potter in Universal Studios is a very different concept. It’s more immersive in that you are walking in Harry’s world. You can go to Hogsmeade, Diagon Alley, Knockturn Alley, and you can go inside all of the shops from Ollivanders to the Weasley’s and then perhaps get lunch at The Three Broomsticks. You can exchange money in Gringotts bank and then hop on the Hogwarts Express that will take you over to the other section of The Wizarding World of Harry Potter. Of course being Universal Studios, there also rides, and the Forbidden Journey was the Husband’s favourite ride in all of Orlando – we didn’t go on it as motion simulators and I do not see eye to eye! But whilst the Husband enjoyed the rides, the kids and I went into all of the shops on Diagon Alley and in Hogsmeade, buying anything from wands (obviously) to Pygmy Puffs to Butterbeer. The truth is, I now want to drink frozen Butterbeer daily, but it seems that there are only four places in the world that they serve Butterbeer, so we have been spoiled by going to two of them in the last month! In London it’s not frozen, but they do have a delicious Butterbeer ice cream that I’d highly recommend. Just thinking about it as I type this makes me want to go back there. For me, riding the Hogwarts Express was the highlight at The Wizarding World of Harry Potter. The train pulls into the station and you board it into a carriage just like the books and films. As you travel, there are images playing outside the window so you get to see the English countryside and a few familiar sights. Inside the train, you see silhouettes walking through the corridor outside your carriage, and listen to the characters chatting out there. It’s wonderful. Are you a Harry Potter fan and have you visited these? Or have I now made you really want to?! Disclosure: We were invited to visit Warner Bros Studio Tour The Making of Harry Potter FOC, but Orlando was all our own trip! We haven’t visited either which is something we really need to rectify soon as both Abby and I love Harry Potter. Oh yes, you’ll both love them! Wow Jocelyn, both look incredible. it’s been about five years since I went to the WB studios and it looks like so much has changed since then, I love the sound of the Forbidden Forest. I still hope one day we’ll make it to the Florida one but the film geek in me thinks the studios will always be my favourite!